Designed with intuitive adjustments and ease of use, the Sylphy office chair is made to fit almost everyone for comfort all day long. The S-shape back mimics your spine and features recline and tilt-adjustment dials that require few rotations to move between settings. Its multi-density foam seat cushion is softer in front and firmer in back for enhanced support. This chair is available in the U.S. only at Room & Board. We believe it’s important to understand features that make each chair unique so you can find what works best for your needs and preferences. Get to know the ergonomic benefits of each feature and how it relates to your work style. This chair offers reclining capabilities that reduce stress on your back and encourage movement throughout your workday. It features recline and tilt adjustment dials that require few rotations to move between settings. A forward tilt action promotes healthy spine posture and relieves lower back pressure. Form-sensing mesh and an adjustable lumbar curve provide additional lower back support. This chair’s S-shaped back mimics the natural curve of your spine to provide the greatest amount of lower back support when seated, which is important if used frequently or as a primary task chair. 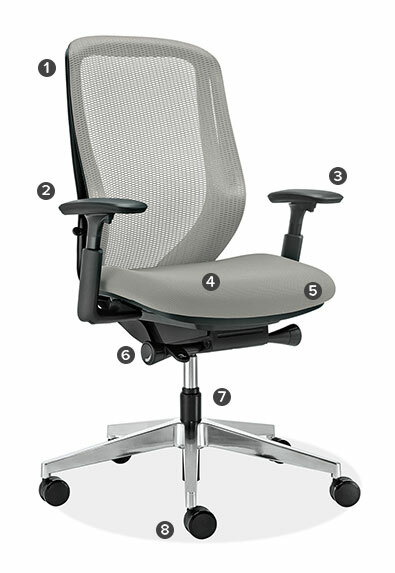 Armrests offer extra support throughout the workday to reduce strain on your upper arms and neck. The Sylphy chair has 3-way adjustable armrests and the Mid-back version features fixed armrests to complement each chair’s respective design and provide the right amount of support. This chair’s multi-density foam seat cushion is softer in front and firmer in back to minimize pressure on your thighs and knees to ensure lasting comfort and proper circulation in your legs. Adjusting your seat depth to thigh length provides a comfortable, healthy sit. This is a helpful feature if the chair will be used by more than one person. Tension control regulates the effort required to recline. This is an especially helpful feature if the chair will be used by multiple people, as it can be adjusted to accommodate personal preferences. This is a great feature if the chair will be used by multiple people or at more than one work surface. Position your seat height so thighs are parallel to the floor and feet are flat for healthy circulation in your legs. This chair features soft plastic casters that are ideal for hard floors, like wood, tile or cement and are also suitable for carpeted floors.